Rio de Janeiro’s chances of becoming the first South American city to host the Olympics received a boost when the IOC published its evaluation of the four contenders for the 2016 Games on Wednesday. Rio is competing with Chicago, Madrid and Tokyo for the right to stage the 2016 Summer Olympics, with the final decision being made in Copenhagen on October 2. The IOC report is an important indicator ahead of the vote, making a series of judgments on criteria such as venues, financial viability, transportation plans and levels of public support for each bid. All four bidding cities received a mixture of praise and criticism, but Rio’s presentation and documentation was judged to have been of the “very highest quality.” Chicago also received high marks in the evaluation, but the Tokyo bid was criticized for a “relatively low level of public support” in an IOC opinion poll. Madrid, who narrowly missed out in the race for the 2012 Games won by London, were marked down for problems with their administration. “Given the current complexity and magnitude of delivering a major multi-sports event such as the Olympic Games, this could result in organizational and financial challenges,” the IOC said. Rio did not escape criticism with the lack of hotel accommodation highlighted, while there were doubts expressed about the financial guarantees of front-runners Chicago. The Lausanne-based IOC does not rank or grade the cities in the evaluation, but it is considered an important milestone ahead of the vote by its 106 members in the Danish capital. Carlos Nuzman, president of Rio 2016, was clearly delighted by the evaluation. “I am very happy that this report confirms the IOC’s approval of our project and vision for the Games and that Rio is considered ready to welcome the Olympic and Paralympic Games to South America for the first time.” The evaluation commission’s visit to Rio was a great success and this has been highlighted in their description of our documentation and presentations as of ‘a very high quality’.” Rio hosted the Pan-American Games in 2007 and will provide key venues for the football’s World Cup in 2014. Tokyo last hosted the Olympics in 1964, while Chicago would be the first American city awarded the Games since Atlanta in 1996. 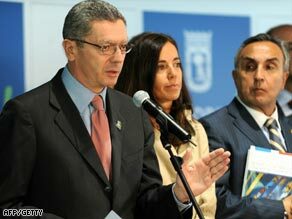 Madrid is hoping to be the second Spanish city after Barcelona in 1992 to win the Summer Olympics.